Sensei	is ready to help you get the answers you need. Sensei	will reply to your questions about Get extension name	shortly. We appreciate your feedback about your support experience with Sensei, developers of Sensei. This helps us maintain high standards on the WooMarketplace, and helps Sensei improve. Glad to hear it went well with Sensei. Tell us more. Did Sensei get back to you? Do you have any additional feeback for us or Sensei? Teaching coursework has never been easier, all within WordPress. With the Sensei plugin you can create courses, write lessons, and add quizzes. Set lesson and course pre-requisites, allow user registration and even charge for your course content if you want. Sensei is the ultimate WordPress learning management system! Please login if you wish to upgrade a license key. Using Sensei is as straightforward as creating a WordPress page or post, with it being powered by its own Lessons custom post type. The plugin is designed around the intuitiveness of the WordPress user interface, making it the best Learning Management System for WordPress. Period. Create courses, write lessons, and then add quizzes to test your learners. Setting up prerequisites for both courses and lessons is a breeze in this hugely flexible plugin. Signing up for a course is with Sensei using WordPress user registration. Learners then have access to a dashboard and can track their course/lesson progress. Sensei seamlessly integrates with WooCommerce, allowing you to charge for courses. Set up a product and link it to a course. You’re done. Sensei will function out of the box with most well-coded WordPress themes, with default styling provided in the plugin. Sensei provides reporting facilities that give you an overview of your content, grades, and students registered with the site. With a variety of question types at your disposal, there’s virtually no limit to the kind of quizzes you can create. Create a ‘bank’ of questions, and display a random selection to your learners when they take a quiz. Have quizzes graded automatically, or choose manual grading for questions that require review by a teacher. Tell us what new Sensei features you want, and vote for your favorites on our Ideas Board. Something missing? There’s an extension for that! Sensei provides a powerful, extendable, framework for offering courses online. Using our collection of extensions, create a course tailored to your Learning Management System needs. Set a pace at which your students learn. Award students with a certificate of completion for their courses. A widget for showing progress within a course. A widget for displaying learners taking a course. Let learners share their course progress on social media. 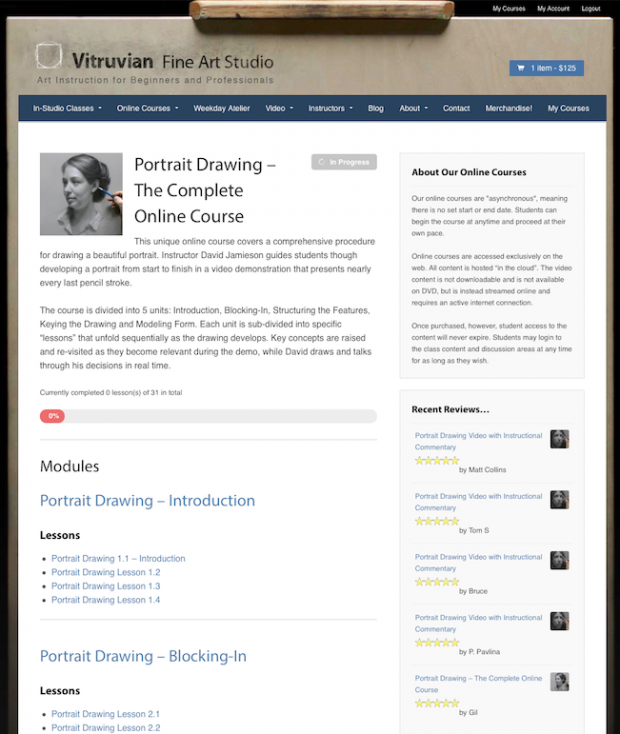 Find out how Vitruvian, a fine art studio in Chicago, have used used Sensei and WooCommerce to sell online art courses. Is Sensei a Membership plugin? What kind of Quiz Questions can I create? Can I customize the layout and styling of the plugin? Will Sensei work with my theme even if it’s not a WooTheme? Can I use Sensei on a multi site installation? Can we use multiple videos, audio, and pictures in Courses and Lessons? Can I grade my learners’ results manually? Can I translate (localize) Sensei? What type of video is supported? How do I use my affiliate link to promote Sensei? Does Sensei support SCORM and what about importing content? Does Sensei support certificates for passing courses? No. Sensei handles the creation and publishing of Courses and Lessons. It can be used in conjunction with membership plugins and eCommerce plugins to sell access to Courses. See Sensei and Membership for a guide on how to do this. Sensei supports many question types for your learners to answer. You can now grade your learners by having them answer Multiple Choice, True/False, Gap Fill, Multi Line, Single Line, and File Upload questions. Yes, you can use Sensei’s templating system to achieve this. We created a guide in Sensei Theming to help you do this. Yes! Sensei has been developed to work with any WordPress installation. You might be required to add some code snippets for the layouts to appear correctly, if your theme is built in a way that conflicts with Sensei wrappers. This is explained at Sensei Theming. For starters, we made it fully compatible with all default WordPress themes. We also provide the code you need to ensure compatibility with some of the most popular WordPress themes. Can I use Sensei on a multisite installation? While Sensei has not been designed specifically for multisite use, it can be used in a multisite environment, where it is activated and managed separately on each subsite. Sensei data cannot be shared between subsites. To work on a multisite setup, you need to purchase a key for each site using the 5 or 25-site subscription options. Can I use multiple videos, audio, and pictures in Courses and Lessons? Yes, you can use the editor area, as well as the video embed field. Any content that you can upload to the WordPress editor may be used. Can I grade my learners’ quizzes manually? Sensei automatically grades your learners’ quizzes, if you have chosen this option for the lesson, but it can only automatically grade Multiple Choice and True/False question types. All other question types must be manually graded using the new grading area. You can manually grade all questions if you prefer. Yes. Sensei has a built-in language localization system. As of version 1.9, Sensei translations are available as language packs that can be installed from your dashboard. For more information, see Localizing Sensei. WordPress includes a native video player for videos uploaded directly to your site via Add Media button. You can also use the oEmbed function to embed external videos. We recommend Vimeo Plus if you want to protect your video content. Sensei does not support SCORM import/export for version 1x. We have supported the standard WordPress import/export functionality from version 1.